Would you be able to protect your property in the event of a fire? Home > Would you be able to protect your property in the event of a fire? Fires can start from a small flame, and they can quickly grow in size and become uncontrollable. Fire fighting trailers from Southwest Trailers allow you to control small fires before they grow in size. 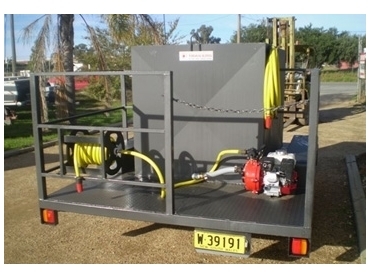 These fire fighting trailers have been custom designed by the company to include a range of accessories that will be of use in the event of a fire. Thanks to their ability to be easily and efficiently attached to almost all makes and models of car and ute, the trailers can be used to control and stop fires that have started a number of kilometres away. This eliminates the need to race around the property and home to locate the necessary equipment required to fight a fire, as they are all stored in the one convenient location. More time can subsequently be spent controlling and stopping a fire before it gets out of hand and becomes an extreme safety hazard. The fire fighting trailers have a durable design that ensures fire equipment is well protected, and they feature a high quality, robust construction which allows them to withstand contact with hot flames. The fire fighting trailers can be stored in a shed near the home, so in the event that a fire outbreak arises, it can similarly be put out quickly and efficiently. These fire fighting trailers offer piece of mind and enhance the safety of both your loved ones and property as they contain all of the relevant equipment required to contain and stop fires within the home and on the land.